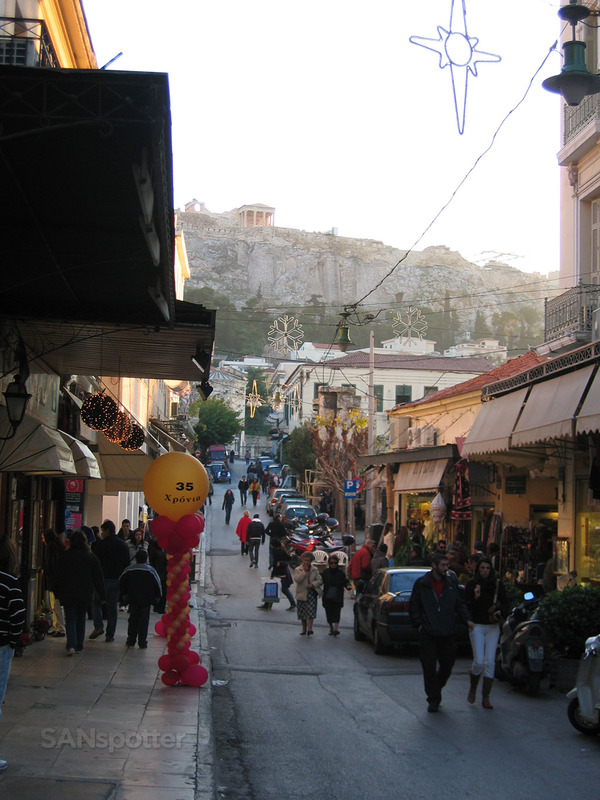 I just returned from Athens, and while I didn’t think it was the most interesting place I’ve ever been, I thought I would take a few moments to jot down some of my thoughts about the place (and post a few pics as well). So let’s start from the very beginning, shall we? 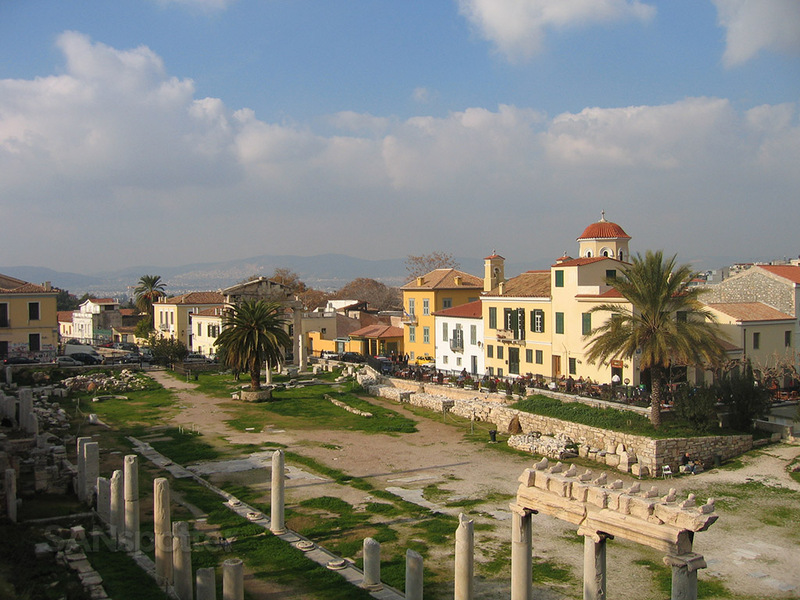 My flights from San Diego to Athens and back were booked on Northwest and KLM airlines. Economy class, of course, but hey – I’m still trying to build up my World Perks account balance in order to blow it all on a big business class reward to Asia sometime in the near future. Economy class would have to do for now, but I got roughly 14k miles/points from the trip so that’s nothing to really complain about. 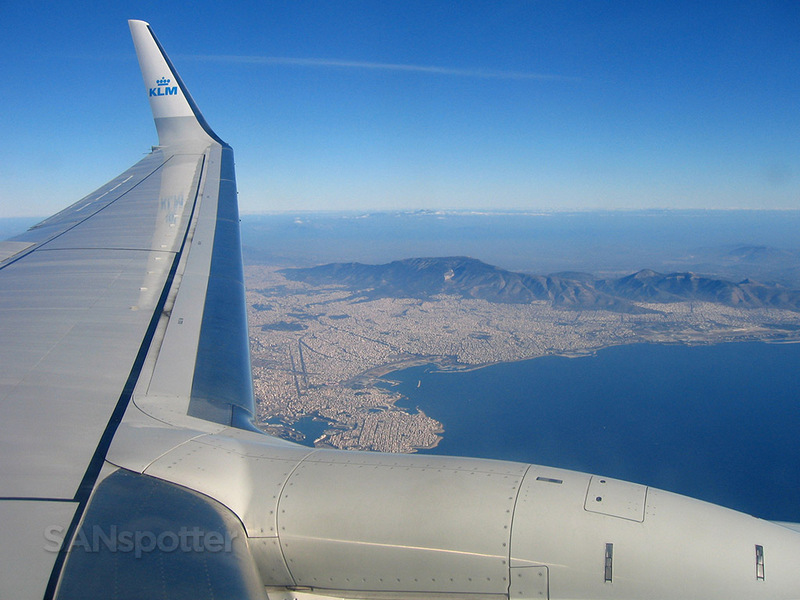 The flights over were decent, but for some reason or another I was completely exhausted once we reached Amsterdam. Seriously, I had very little energy to wander around the airport taking pics so I just found a quiet space to sit and relax for a bit before boarding to Athens commenced. But I’m happy to report that I was feeling much better (and much more energetic) by the time we hit the ground in Greece. 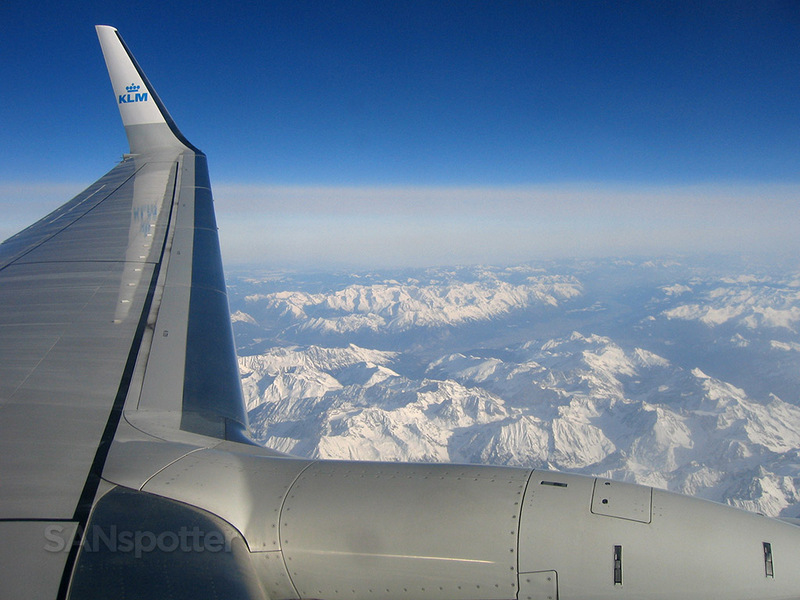 The Alps! This was the view about an hour into the 3 hour flight from Amsterdam to Athens, so I’m guessing this was somewhere over southern Germany or Austria. 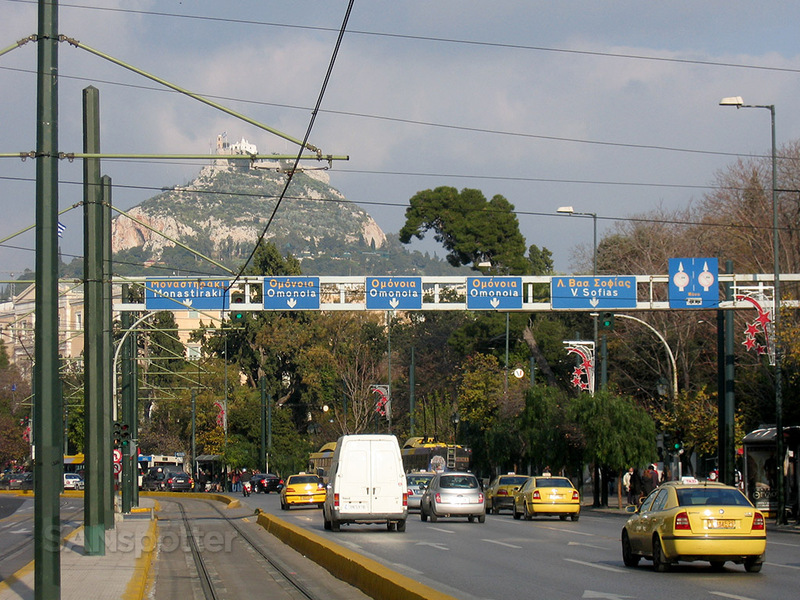 I hopped on the train at the airport to head into central Athens, which ended up being quite a nice ride and very easy to figure out. Normally it takes me forever to figure out what train to board and then I always worry about getting off at the right stop. But this time it was pretty easy – and much better (cheaper) than a taxi would have been! Unfortunately, I wasn’t able to use this same train on my departure day since I had a very early flight out of ATH and the trains would not be running that early in the morning. But if I had a later flight I definitely would have used it. The walk to my hotel was an interesting one, as I was approached by a seemingly nice guy who was eager to show me around and…well…I’m not sure what else. I immediately figured it was a scam of some sort, so I politely brushed him off as best I could and was on my way. It was a long walk for sure though – I was pretty much exhausted once I found the hotel. 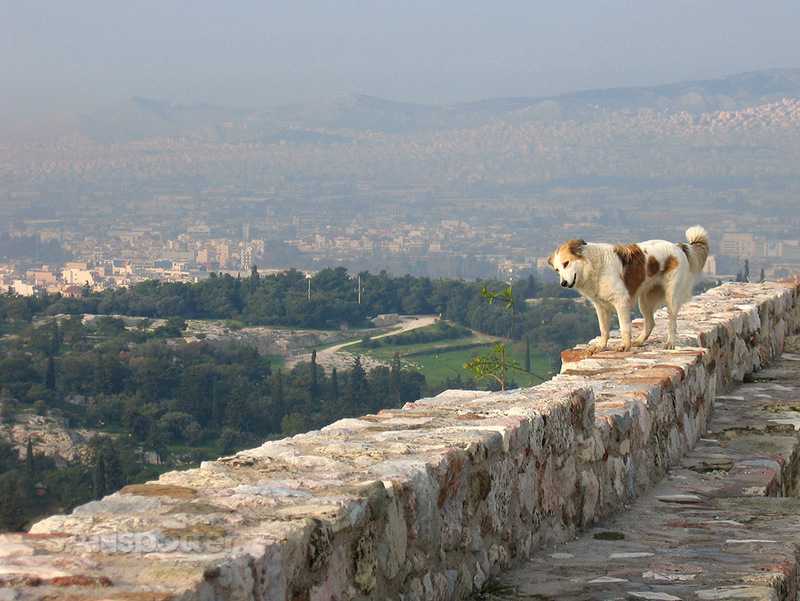 The Acropolis sits very high over the city of Athens – and the only way to get up there is to walk! Along the walk to the top, there are many interesting sites to see. 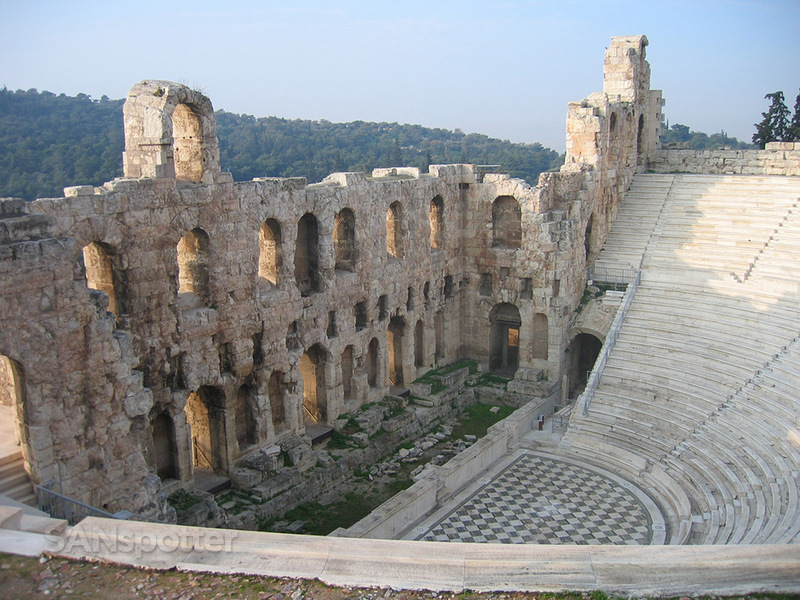 This is the Odeum of Herodes. Another view – looking towards the front. 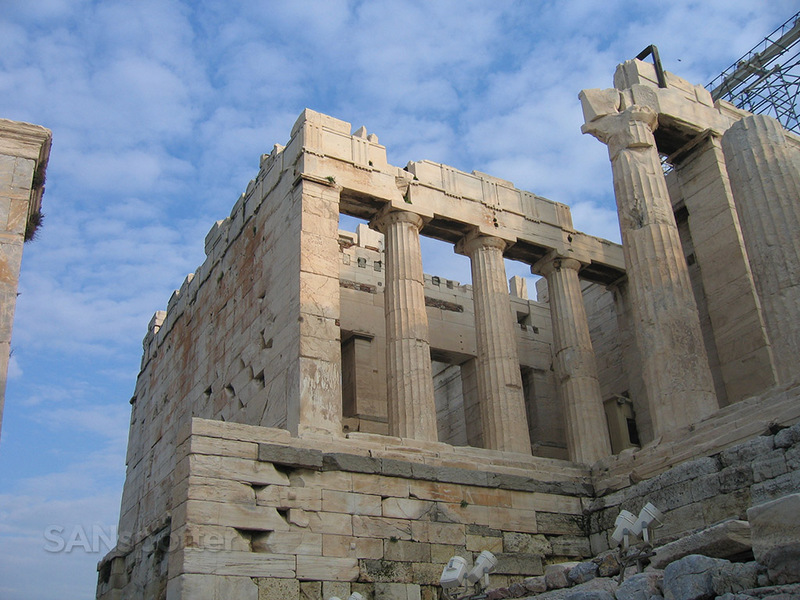 This is the Propyla, which is the entrance to the Acropolis. As you can see, there are renovations in progress. Another view. Apparently, very little of these structures are still original – much of it is reproduction. 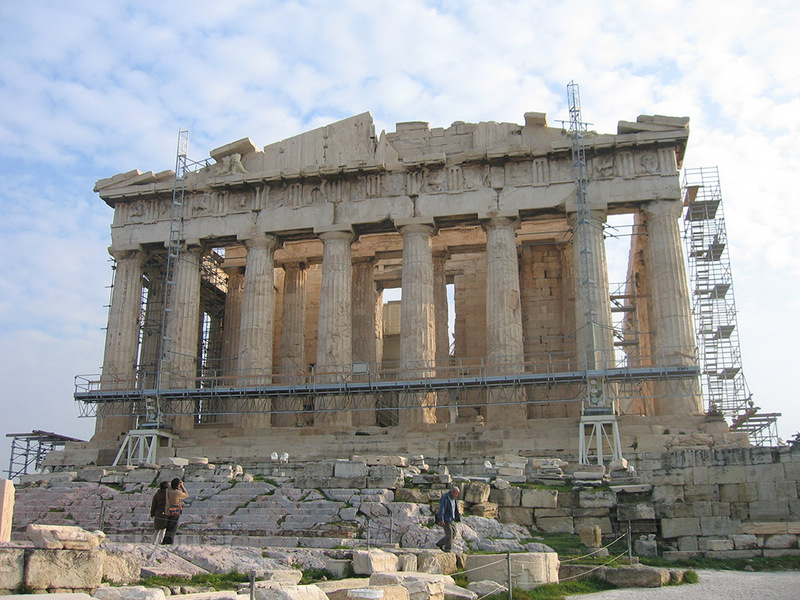 The Parthenon – undergoing renovations since 2000. 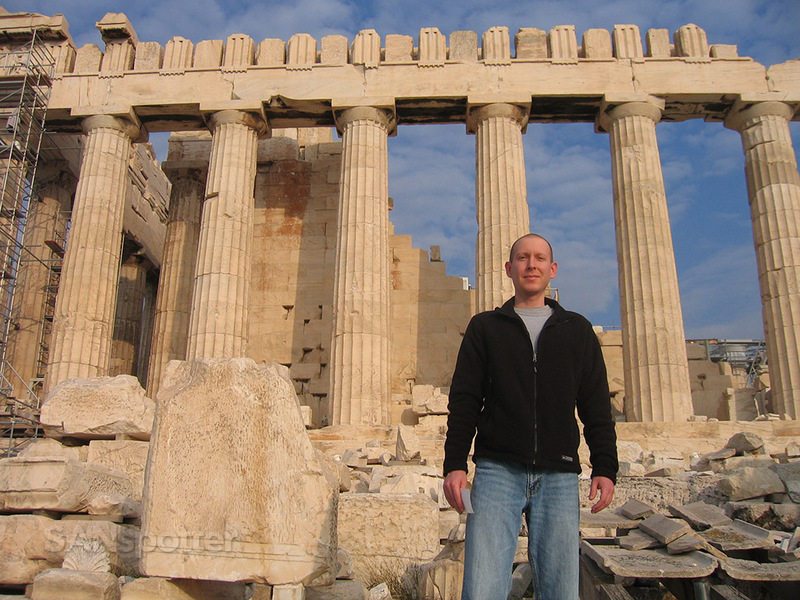 That’s me, standing in front of the south side of the Parthenon. 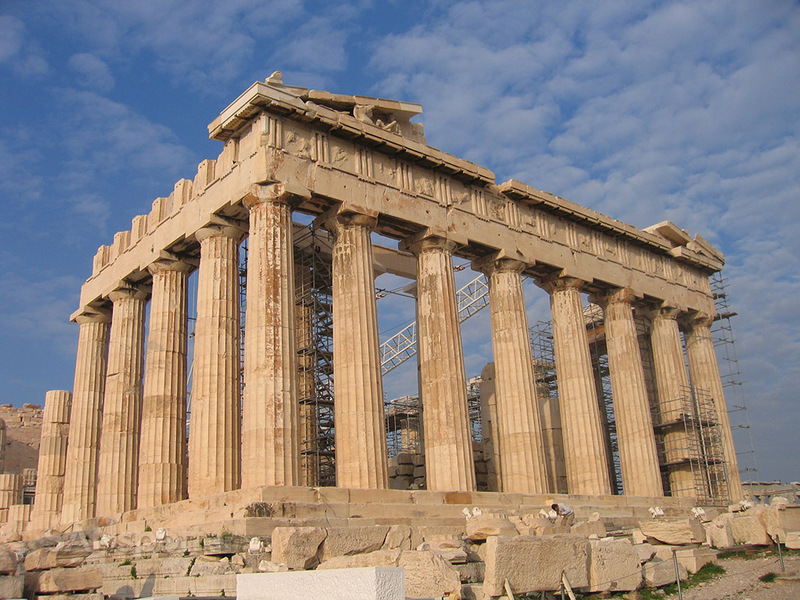 Did you know that the Parthenon was originally painted in bright colors? I didn’t – I guess that means I should have paid more attention during art history class! make walking around up here very difficult. I visited at the right time of year! 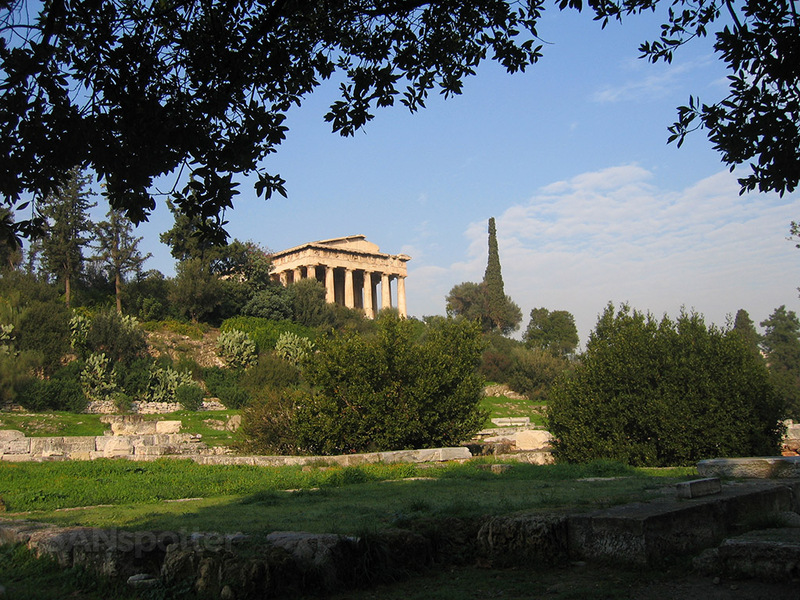 sitting on a park bench resting my feet from the Acropolis hike. 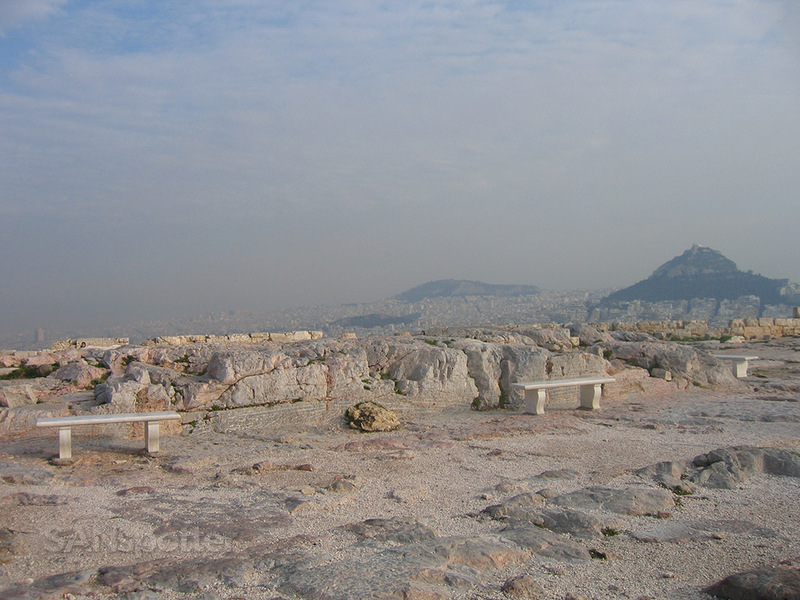 This is a bad pic, but you can see how high the Acropolis sits over the city. Stairs and hills everywhere! If it were summertime, these walkways would be packed with tourists. 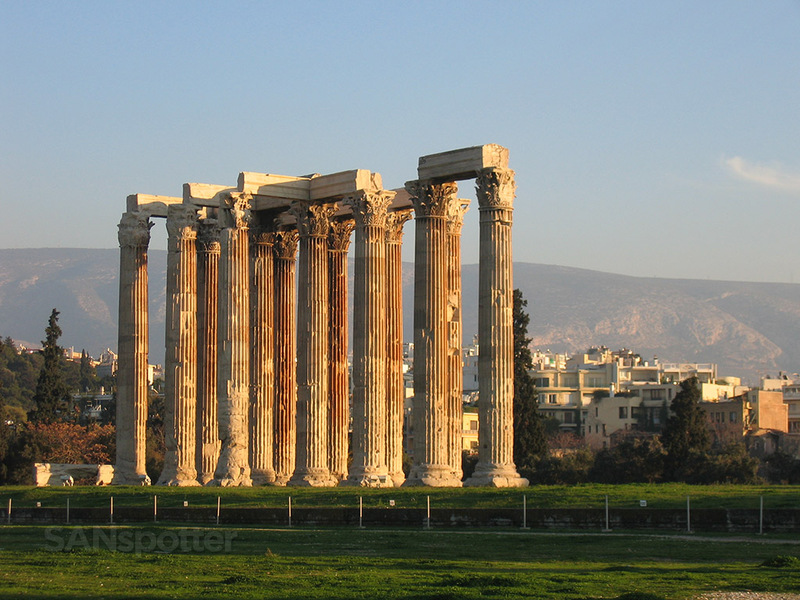 This is the temple of Olympian Zeus (in the National Garden) located right across the street from my hotel. 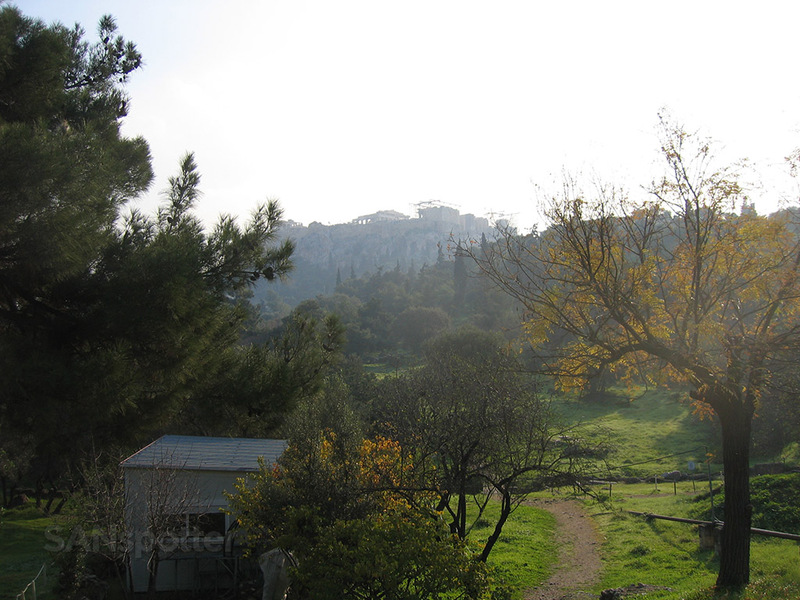 Terrible pic, but that peak is Lycabettus Hill. I didn’t get the chance to go up there (this is as close as I got), but I was told the views are awesome. 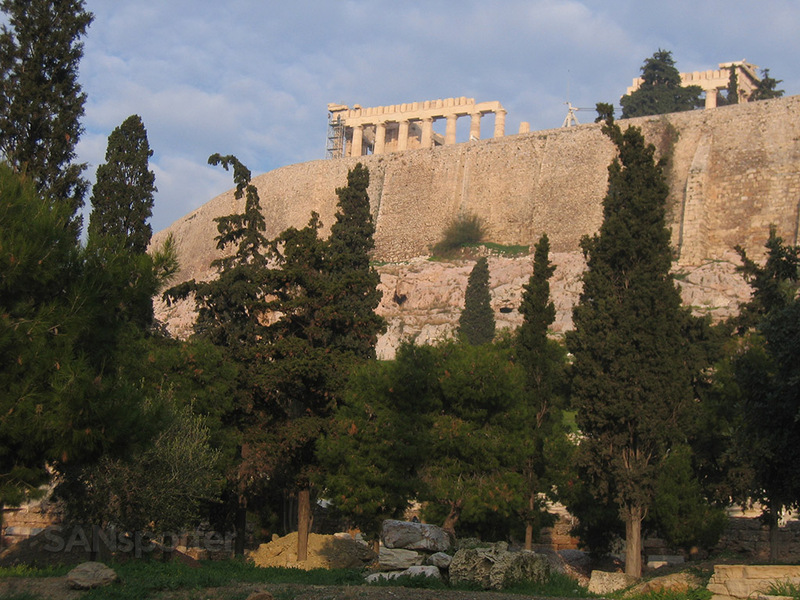 All in all, I liked Athens. 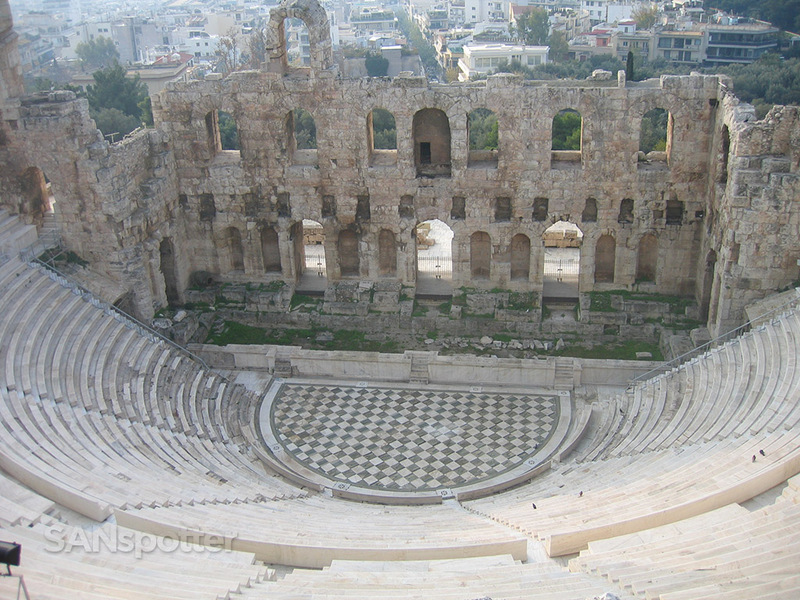 But other than the monuments and ancient ruins sprinkled around the city, I didn’t find it to be a truly amazing place. I wasn’t really expecting it to be amazing – which was good I guess, but still. My one day of walking around and exploring left a lot to be desired and I left thinking if I would have thought differently about this city if I would have had the chance to spend some more time there and look around in greater detail. 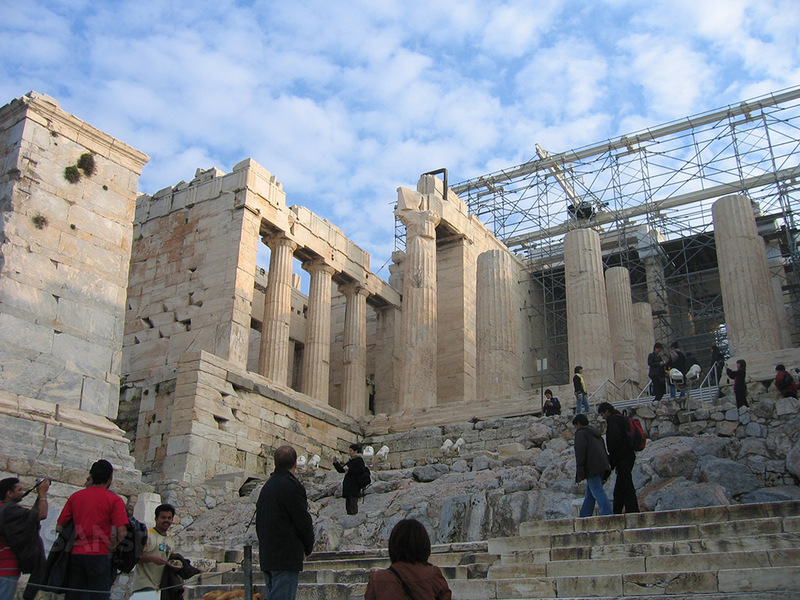 I’m definitely going to try and make it back to Athens some day just to give it the chance it deserves! On a side note, my flight out of Athens on Christmas morning was nearly derailed as they had a LOT of trouble finding my reservation and I had to get rerouted on Air France through Paris instead of KLM through Amsterdam. The flights were certainly light though – CDG to DTW was more than half empty. 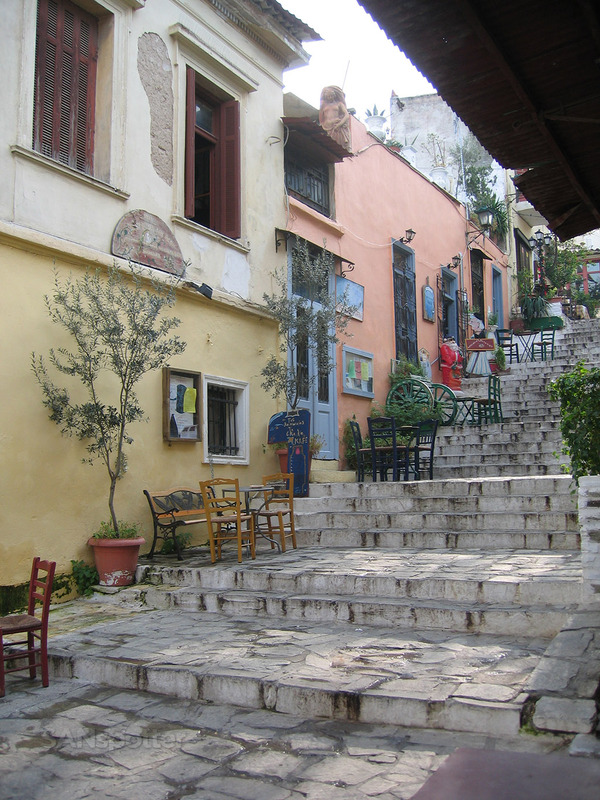 Mental note: spend more time in Greece.